ZAR6 calculates dimensions of bevel gears (straight, helical and spiral toothed), and load-bearing capacity with safety against root fatigue fracture, pitting and seizure in accordance with DIN 3991. Quick input provides input of all dimensions, load, material, parameters for strength, lubrication, application and manufacturing in one dialogue window, with calculation and output as desired in tbales, drawings or diagrams. In pre-dimensioning ZAR6 makes recommendations for the dimensions of bevel gear, from input of gear ratio, rotational speed and power or torque. ZAR6 includes a material database with all essential gear materials, that may be extended by the user with new materials. The pre-dimensioning values can be used in the geometry calculation. The normal central modulus can be calculated from the outer module met or reverse. The program also supports an angle correction if this is necessary, likewise the strength matching of pinion and disk gear via tooth thickness variation. ZAR6 suggest a value for addendum modification factors. You can select tolerance zone to DIN 3967, and ZAR6 calculates min and max dimensions of inner and outer tooth thickness, flank clearance and backlash. And ZAR6 calculates pitch tolerances, flank tolerances and permissible runout according to DIN 3965. "Quick-View" shows calculation results together with bevel gear drawings altogether on one screen. The safety margins against root fatigue fracture, pitting and seizure are determined in the strength calculation acc. DIN 3991. A diagram shows the curves of safety factors and life expectancy as function of torque. Axial and radial forces for push/pull operation are calculated. 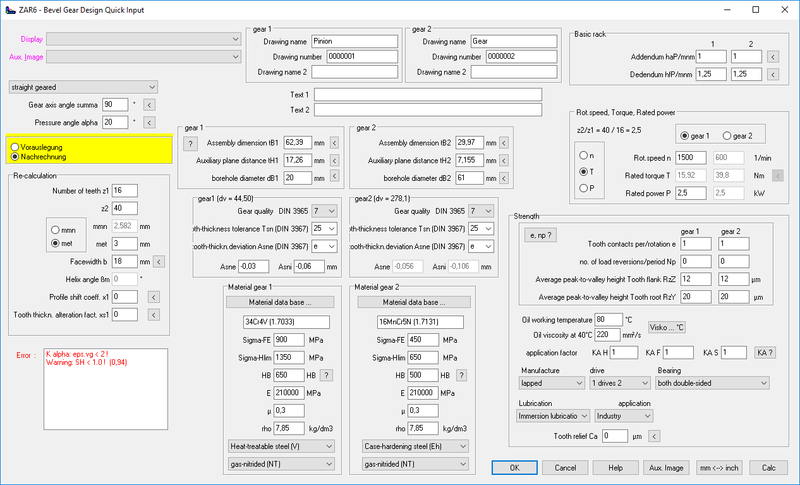 These values can be transfered to the shaft calculation software WL1+. Input data and results of gemometry and strength calculation can be printed to screen, printer, file, or exported as HTML table for the web, or be exported as txt file for Excel. A true-scale drawing of the calculated bevel gears can be exported to CAD via the DXF or IGES interfaces. Control output to screen or printer is also possible. ZAR6 generates complete drawings with the essential manufacturing data for straight and helical bevel gears. Drawing info and modification index can be entered in the program. The drawings may be printed directly, or loaded by CAD via DXF or IGES interface. As with all HEXAGON programs ZAR6 can provide you with a help text and auxiliary picture for each input. Help texts and auxiliary pictures can be modified and appended by the user as required. When error messages occur you can have a description and remedy suggestion displayed. ZAR6 is available as 32 bit and 64 bit application for Windows 10, Windows 8, Windows 7. CD-ROM or zip file containing ZAR6 program and pdf manual, License agreement for an indefinite period of time.